Where flowers bloom on Temple Square. A special feeling fills the air. Now friends can meet along each aisle. The organ thrills us with its music. It’s conference time; the heavens smile. Our thirsty hearts like answered prayer. In faith and truth—no doubt, no fear. Will bless the people far and near. OK, this is not her best work (Sitting for hours in the cold October rain is supposed to remind us of God's love? ), but hey, how many poems are there about General Conference itself? Though Elizabeth is not old enough for most of these activities, I have friends and family members who might like to print a couple out for their kids to do during conference. 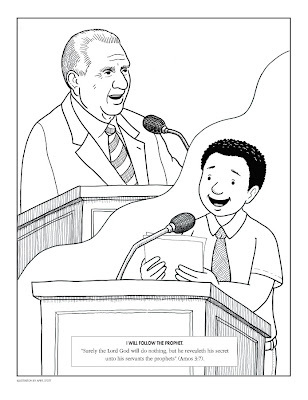 For more ideas, search the Friend at LDS.org for "Funstuf" or "For Little Friends" or "Conference"
You can get pictures of general authorities from the last conference issue to update the games that need it. If anyone knows where to find it online let me know. I've also scanned in a few of the pages I've pulled from old Friend magazines that have pictures that aren't online. Wow, that's a lot of stuff! Thanks!